^ 3.0 3.1 Tai, Yu-liang. 緬甸 Myanmar/Burma. [2010-10-23] （中文（繁體）‎）. ^ 4.0 4.1 Birsel, Robert. 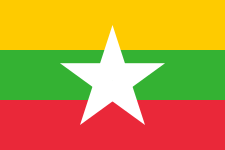 Myanmar gets new flag, official name, anthem. 路透社 (http://www.webcitation.org/5thEflNof). 2010-10-21 [2010-10-23]. ^ 5.0 5.1 Myanmar unveils new flag. AP (海峡时报). 2010-10-21 [2010-10-23].